I was really trying to get these cards posted last night, but it was so dark and dreary yesterday that I wasn't able to get any photos taken. The sun is out in full force today, thankfully, so I was able to snap these photos while the daycare kids were napping. And if all goes well, I'll get this post finished before they wake up. I always need birthday cards, and yet they are the one kind of card I never seem to make that often. I have a crazy amount of thank you card, just saying hi cards, miss you cards, cheer up cards, and good luck cards. You know, the kinds of cards that I never seem to actually use. There's always birthdays popping up randomly throughout the year. Some that I know about, and some that are total surprises to me (meaning the girl's friends!). Although, if I'm being totally honest, even when I know a birthday card is needed, you will most likely find me tossing one together two minutes before we're leaving for the party! True story. 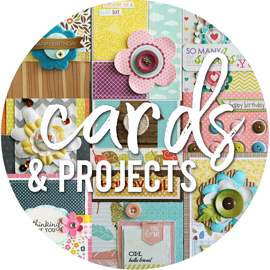 I recently worked with the new DIY Boutique collection from Simple Stories for an upcoming layout in Scrapbook & Cards Today. Somehow or another, I accumulated a TON of scraps while working on my layout. I was cutting into papers left and right, not really having a solid idea in mind going into the design process. Instead of filing all of those scraps away, I figured I might as well put them to good use now, instead of hoping that one day down the road I'd want to do something with them. These birthday cards were so easy to throw together. I choose a "happy birthday" sentiment from the Silhouette store, along with a fun scalloped border (both by Lori Whitlock). I sized them to fit the front of a standard card, and arranged them so that I could cut them from four different colors of paper. That would give me two "birthday" and two borders in each color that I could mix and match. On the backsides of some of the patterned papers were bright solids that matched the patterned papers in the collection. I simply used a three inch strip of the pink, orange, blue, and green papers, and lined all four of them up on my cutting mat at once. Afterwards, I cut eight of the "happy" part of my sentiment, all from black cardstock. I ended up using the same exact patterned papers for all eight cards. I cut a one inch piece of the "Lovely" sequin patterned paper to adhere across the bottom of the card, and a half inch strip of the "Newspaper" patterned paper to adhere directly above it. I then added one of the border pieces that I cut underneath the newspaper print strip. I waited until I had adhered my sentiment before I added my machine stitching. I knew I was going to do a zig zag stitch, which would partially stitch on the "birthday" piece. To finish off the cards, I added a few enamel dots to the newspaper strip, and a few stickers to the top right corner. Easy peasy, right? I did these all assembly line style, so I would adhere one element to all eight cards. Then the next element to all eight cards. So on and so on. Not sure how long these eight birthday cards will last me, but it's nice to know I have some on hand. Something I've been wanting to do for a while now is to randomly share bits and pieces of my scrap space. I'm always looking for new ways to organize my stash and supplies, and love to switch things up to freshen up the room. Today, I thought I would share how I organize my washi tapes. Last year, when I was working on my Bella Blvd class that I taught at CKU, I needed a way to organize the tapes for the classes. We were working with ten different tapes, and I knew I would need a set of those ten tapes for every two students to share. I came up with the idea of putting the rolls of tape on large binder rings. This was such an easy way to keep the tapes organized. After finishing up at the last CKU, I was left with this large amount of binder rings. So I figured why not use them to organize my own tapes. I don't have a huge amount of washi tape. I have a decent amount, but not a huge amount, compared to some collections I've seen out there. I knew I wanted a way to know what manufacturer each roll of tape came from. Most tapes, once out of their package, don't have any markings on them to tell you where they're from. And I'm honestly not that familiar with most of the tapes to remember on my own. So I sorted out my tapes by manufacturer, and then put them on rings together. Some manufacturers might have just one ring, some might have two to three rings. They're easy to add too, if I get new tapes. And they're easy to take apart, if I want to remove a roll or two for something. To label them, I took out some really old vellum tags, scribbled the manufacturer's name on, and added the tag right to the binder ring. Then I just toss all of the binder rings into a basket. I'm a "digger". I love to just pull out a basket and dig around to find what I need. Often times, what I end up choosing isn't even what I had in mind starting out. Now, I do keep my Bella Blvd designer tapes seperate. Partly because there are a lot of them, and partly because I use them more often then the rest of my tapes. I have this old wood tray that I got years ago (from TJ Maxx), and it sits on the corner of my desk for easy access. I have all of my Bella tapes tossed in there, and they're always within arms reach. I was looking for something to go inside the wood tray to help organize things, and I realized that three of these little metal buckets that I picked up at Target's dollar spot fit perfectly across the tray. I couldn't fit two rows of the buckets, as it was too tight a fit. But I had some small black plastic baskets, also from Target's dollar spot (love that place! ), that tucked right in there very nicely. However, I recently found these divided wood trays at TJ Maxx, and picked up a few, knowing they'd be perfect for my scrap space. If you're a fan of Project Life, and you're lucky enough to find these, I'll let you know that 3x4 cards fit perfectly in these trays. Standing up, of course, in rows. You could fit a TON of 3x4 Project Life cards in one of these trays. I am most likely going to switch out the old wood tray on the corner of my desk, to the new divided wood tray. I can toss my Bella Blvd designer tapes in a few compartments, and then fill the rest with some of my most used embellishments or supplies. When I get around to making the switch, I'll be sure to share. So, here's the thing. Over the past year or two, the amount of scrapbooking "work" on my plate has gone down significantly. For a few reasons. I have so much less that I "have" to do these days, compared to what I was doing a few years back. I know what you might be thinking. If I have less that I "have" to do, doesn't that leave me more time to do what I "want" to do. Not really. It turns out, that after years of doing so much design team work, I have become very assignment-driven. You get used to being told what to scrap about, what sort of techniques to do, and what kind of product to use. You're given deadlines and due dates. So, without those assignments, it turns out I have a hard time deciding what to do. I'm left with making all of those decisions on my own. What photos and stories do I want to scrap? What products do I want to use? It's all up to me. Which sounds quite freeing, right? It is, and yet it leaves me feeling lost all at the same time. It's weird. There's also the time factor. I guess that has a little something to do with how much or how little I scrap. Life is busy. Really, really busy. My free time is more limited these days. And most of the time, when I do have some free time, I'm honestly just too tired from work to do much. We have a sketch feature up on the Bella Blvd blog today. I love seeing each and every project from our designers come thru my inbox each week, and I'm always thinking "ohhh, I love this design" and "ohhh, I love that design". So for this month's sketches, I picked out a few recent projects from our design team that had caught my eye design-wise and asked our own designer, Diana Fisher, to create sketches based off those projects. This sketch is based off a layout by design team member Becki Adams, which she created for CHA Winter using the Max collection. You can see her layout HERE. And here's my take on the sketch. This sketch feature was originally scheduled to go up on Valentine's Day, so I started out wanting to use pieces of the Kiss Me collection. I knew I wasn't going to do an actual Valentine's or love themed layout. My plan was to focus more on using Valentine's colors. While looking for photos, I stumbled upon these photos I took of Sarah on her 12th birthday, two and a half years ago. I have never scrapped them, and it's always nice when I can stay away from re-scrapping things, just to fit an assignment. I started out with the pink grid patterned paper, which I knew would be the perfect subtle pattern for creating the circle die cut background that I had in mind. I used my Tiny Attacher to staple each corner down onto my white cardstock, which I had misted with a tiny bit of green, pink, and aqua misting sprays. I knew I wanted to use the polka dot border strip from the Kiss Me borders paper, so that's where I pulled all of my colors from. Navy blue, aqua, green, pink, and white. I pulled the navy blue paper from the Snapshots collection, the aqua circle paper from the Play Date collection, and then added in some embossed green cardstock. This is my second take on the title. It was originally "Twelth birthday". I obviously don't write "twelfth" that much, since I had NO clue there was an "f" in it. I had taken photos of the layout and had them all edited. I went to save them, and it was then that the computer tried to tell me that "twelth" was spelled wrong. Ugh. I had to tear apart that entire section to fix it, and squeeze that goofy "f" in there. And to be honest, it still doesn't look like it's spelled right to me. Lol. To embellish the page, I dug out a few coordinating flowers. I guess we could say the green chipboard piece is kind of like a flower, right? I like the look of mixing different types of flowers, rather than having 3 of the same kind, but just different colors. An older pink fabric flower, an aqua crochet flower, a green chipboard "flower" accent, and a birthday girl flag tucked in for good measure. It's been a little quieter on the assignment side of my scrapping, so for once, I'm working ahead on some upcoming projects. Something I never do. I'm pretty sure I have at least eight different projects in the works, all in different stages, and spread out all over the place. I have just been doing little bits here and there, jumping from project to project. Which means I have lots of scraps laying around. I gathered up some of those scraps and whipped up a few extra cards tonight. I was working on a card assignment and had this idea using the open circle background piece, cut with my Silhouette. I only had a few small pieces of paper to work with for this card, so I pulled out a few random pieces of patterned paper and cut three of the circle die cuts. My idea for the actual assignment didn't work, but I still had these three pieces perfect for a few cards. I also had a piece of my favorite white grid patterned paper, which I had sprayed with pink misting spray. I was able to get three pieces that were large enough to use on the three cards. I adhered them on the left side of the card bases, and stapled my circle die cut pieces right on top. I then dug through some of my 6x6" paper pads and found a few woodgrain patterned papers to use for the right side of each card. I took a few scraps of the same papers I cut the circle die cut pieces from and punched some scalloped borders to add to each card. I wanted something quick and easy for the sentiments. I had a few packs of the new Heidi Swapp stickers that I had picked up at Michaels, and they matched the papers perfectly. I had a little issue with one of my packs, since the stickers weren't actually sticky. In fact, they had a shiny backing to them, which meant that I couldn't get any adhesive to stick to them at all. I ended up punching out a circle from white cardstock, placing the two stickers in the center (the outer ring sticker is seperate from the larger circle in the center), and then using my Tiny Attatcher to staple them in place. A little more work than just sticking a "sticker" down, but it was a simple fix. I dug out some older flowers, one of them chipboard, and added my sentiments to the centers before adhering them all to the cards. I think it took me longer to photograph the cards (I detest using my external flash, but wanted to get the pics done to post tonight), edit them, and type up this post ... than to make those 3 cards. When I redesigned my blog banner, I wrote "scrapbooking and a little bit of everyday life". I've always had something to that regard up there, but I know I haven't had as much of the "everyday life" stuff in the last year or two. Not counting any life stuff that gets shared because of a layout or project. I know most of you probably come to see the crafty stuff, and that's all good. But I'm thinking I should make more of an effort to sprinkle in just a little of the "everyday life" on here every once in a while. I thought I would start with a little look at the first half of Alyssa's senior year. Honestly, I've been super bad about using my big camera. But I have gotten pretty good about taking photos here and there with my cell phone, now that I have a phone with that option. I actually rely on her for a lot of photos, as she's always taking photos with her friends at school, band, football games, band concerts, etc. And I have something really fun planned with those, as soon as I can get her to share them all with me. I've shared all of these photos on Instagram, with the hashtag #alyssasenioryear. I love pulling up all of the photos at once, even though there's one stray photo from a stranger with that same hashtag. Lol. So hard to believe we are less than 4 months away from graduation. I try not to think about it too much, as I'm just not ready for it. Luckily, there is so much to do in the meantime, that we don't have much time to think about it. I'll be sure to share more as we go. Happy Monday everyone! 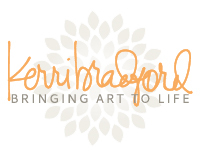 I have a new layout up over at Kerri Bradford Studio today that I'm excited to share with you. I've been sitting on this one for a while, just waiting for the go-ahead to share. With Valentine’s Day sneaking up on us, I was in the mood to create some sort of “love” themed layout. I thought I would do something a little different than a normal love layout, and created an all-about-me type of layout without any photos. I'm pretty sure I've mentioned this before, but I a big fan of doing photo-less layouts when it comes to all-about-me layouts. A big reason is that I don't have a ton of photos of myself laying around, and I also don't always have photos that go with what I am trying to document. I love that it really lets you “play” and have fun with the page, while not worrying about fitting in photos or trying to match them to your products. I took this screenshot to share on Instagram, as I was in the beginning stages of planning out my page. When I'm incorporating lots of Silhouette cuts, I love to sort of "sketch" out my page right there in the Silhouette software. If I have photos, I will pull those in so that I have a good idea of how to size things. For this page, I just created a 5x7" box to represent where my journaling block would go. Doing this allows you to get all of your cuts just the right size to get the look you want. A lot of times, if I don't have a set idea of what I'm doing on a page, I will just guesstimate how big I want my titles or other die cut elements. I can usually make whatever I cut work. But I love knowing exactly what my plan is, and then have everything be the perfect size for what I had in mind. I started out with my favorite circle background from the Background Basics kit. In my original planning, I was just going to cut two smaller pieces, to go on either side of my journaling block. I actually ended up cutting a full 12x12" circle background from the blue dotted patterned paper, knowing that I could use the leftovers for other projects. I also decided that I also wanted to have the circle background on the right side of the page, just to add a little something to the white cardstock background. I love the look of white die cuts on a white background, as it adds a nice subtle interest to the page, without overwhelming whatever else you have going on with other papers, embellishments, etc. This ended up giving me one side of the page for my title and embellishments and one side of the page for my journaling. Because I had quite a few patterned papers that I wanted to include on the page, I used the circle ring cut from the This & That: School kit to cut circles of varying sizes from the different papers and then pieced the inner circles and the rings together using different paper combinations. All of the patterned papers (with the exception of the aqua ticket patterned paper, which is from Dear Lizzy) and the chipboard pieces are from Heidi Swapp's new Hello Today collection, found at Michaels. For my journaling block, I created a 5x7" text box in my Word document, so that I could be sure my journaling all fit nicely in the space that I had allowed (since it was the last thing I added to the page). I listed out a few things that I especially love these days, and then wrote out a sentence or two about each thing. I added little coordinating enamel dots next to each item on the list, and also sprinkled some of the same enamel dots on the right side of the page. For my title, I chose the "love always" from Kerri's February Fourteen kit, and just flip flopped the words so that it read "always love". I adhered the "Love" piece using pop dots to add a little dimension to the page, and then used tiny little alpha stickers from Jillibean Soup to add a little subtitle. I had also misted the right side of my page before I started adding all of the patterned papers and die cuts. Are you wondering why I chose a dark pink mist? That was an accident on my part. I thought I grabbed my favorite "Piggy Pink" mist (I think that's the name) from Studio Calico, and I had in fact grabbed my "Pretty Pink" mist. I wasn't about to start over, so I just went with it. I know I was racking my brain trying to think of which things would make my list for this layout. I think the craziness and busy-busy-busy factor of our lives right now shows in what I love these days. Quiet evenings and relaxing weekends are big on my list. That's probably because we're comingoff a long six months of soccer, which took up a lot of our weekends and evenings. Although high school soccer is starting up now, so that will change again soon. A day to myself. That's definitely a selfish thing. And something I haven't had in ages. But it's also something that I really, really need every now and then. It is truely amazing what I can get accomplished when I have a day to myself with no one around. It usually involves me doing a lot of work stuff. But without little ones running around, or trying to do two jobs at once. I'm pretty sure one of these days will be worked into my schedule soon! Just for fun, I decided to scroll thru my blog and find the last time that I created and shared a layout just for fun. Something that wasn't created for an assignment, but that was created simply because I wanted to make it. After scrolling for what seemed like forever, I came across two cards that I made back in June of 2013. I kept scrolling and found another card that I shared back in December of 2012. And then finally, back in October 2012, I found a layout that I created and shared "just for fun". That's kind of sad that basically everything I've created for over a year now, has been because of an assignment. At least I can say that a pretty good percentage of them have also been layouts that I wanted to make as well, and that I truely do love. Well, I'm happy to say that I created this layout just for the heck of it! I was working on an assignment last week and cut this fun frame piece (purchased from Studio Calico HERE) on my Silhouette. I didn't end up using it, so I thought it would be a great starting point for making a layout just for fun. I had something totally different in mind than what you're seeing. In fact, I was going to do an all-about-me type layout, with no photos. I picked out these patterned papers (from Simple Stories) and had this page design in mind. Then I set out to find a title to cut with my Silhouette. While browsing thru my library, I came across the "fly away" and then the "pack your bags", and it reminded me of a layout I've been wanting to do for a while now. While traveling last year, teaching at the CKU Conventions, I had collected quite a few photos snapped with my cell phone while doing the actual traveling part of the trips. I always thought it was funny that the only photos I would come home with were ones taken at the airport or on the plane. I guess it's because I'm alone and I get bored. While actually AT the event, things are so busy and hectic that I never thought to take photos. I knew it would be fun to compile some of these photos on a layout, and I'm so glad I finally got around to it. I think the "pack your bags" title (from Kerri Bradfords Pack Your Bags kit) was the one that I had in mind for this layout from the beginning. But I realized that I could combine the "fly away" title right along with it, since it fit the theme of my photos so well. 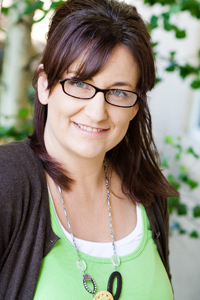 I also used an ampersand from one of Kerri's kits, but for the life of me, I can't figure out which kit it's from. I added a few enamel dots to my title pieces, and some number stickers up in the corner for the year. I left two of the openings in the frame empty so that I could use that area for my journaling. I typed it up and printed it out on the same ruled patterned papers that is at the top of the layout, and matted it on a scrap of the same yellow patterned paper that I cut my ampersand from. And just now, while looking at the photo above, I noticed a word that I left out of the third sentence. Figures. Lol. I measured out the openings for the photos (once I realized they weren't all exactly the same size) and printed out my photos and adhered them behind the frame. These are all photos taken on my cell phone, and I think I've mentioned before that I'm not lucky enough to have an amazing cell phone. So it's actually good that my photos are about 2 inches in size, since you can't tell their imperfections. I also pulled out some colored thread and randomly added some messy machine stitching to parts of the frame. Just to add some color. If you happen to follow me on Instagram, you might have seen me share these photos while on my trips. I would always find myself snapping pics while waiting. And when traveling, I find that you do a lot of waiting around. I took that shot of the empty rows of seats on a flight that hardly had anyone on it, as I was hoping that it would stay that way after the layover (since I was staying on the same plane). It didn't work out that way, and the next flight was completely packed. The photo in the upper corner was taken at my airport. I call it "my airport", since even though I have four airports to choose from within 90 minutes of my house, I will only fly in and out of the Sacramento airport. It's easy to get too and pretty quiet, and I'm super familiar with it. There are two of these HUGE pieces of "art" in the baggage claim area, consisting of suitcases and luggage piled practically up to the ceiling. I think they're pretty cool and had to snap a photo. I tend to take a "wing shot" on each flight I take. I know they all end up looking pretty much the same. But I still love to take them. And if the flight I'm on is "open seating", meaning we can sit wherever we want, I always seem to sit over the wing. Without even trying too. It's just where I find myself once I sit and look out the window. And I always prefer the window seat, if given the choice. I like having the side of the plane to lean my head against for napping. And then there's the photos that I try and discreetly take while sitting at the airport or in the plane. You'll never find me taking an actual "selfie", like of my face. I can't take a decent selfie if my life depended on it. I totally remember taking that middle photo on the bottom. It was after finally arriving in Connecticut, after a super LONG day of travel on 3 different planes, only to find out that the car that was supposed to pick me up had been scheduled for the previous day. I ending up having to wait another two hours for someone to come get me, after which I found out that we had to still drive almost 45 minutes to get to the hotel. Let me repeat. LONG DAY. On one of my trips, we had been talking about airports and I mentioned that at "my airport" we had this ginormous red rabbit flying down thru the terminal. Yes, a bunny rabbit. I'm sure there is something meaningful behind it and/or it represents something about where we live. I'm not really sure. I just think it's kind of funny to see this huge rabbit flying down as you walk through. I had to snap a photo of it the next time I was there. And just today, my sister who was visiting this weekend from Colorado, was flying home out of this airport and I told her about this rabbit and to watch for it if she was going thru terminal B. Sure enough, I got a text from her saying "your red rabbit said hi". So I pulled up this photo on my phone and texted it right back, asking "you mean THIS rabbit". As if there is another ginormous red rabbit flying around our part of California. Lol. 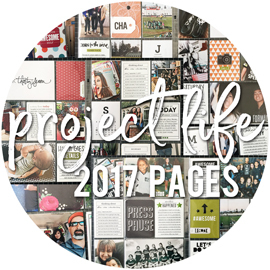 Today, on the Bella Blvd blog, we are revealing our February project sheet! 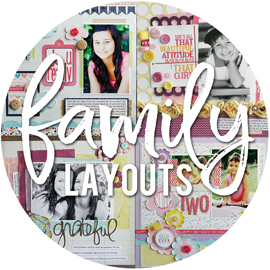 This month, I was asked to feature the Family Forever collection, and to work in a "family love/Valentines" theme to the page. I just couldn't make the Valentine's theme work, so I focused on the idea of "family love". When I first received this collection for CHA work, I immediately thought about a Christmas photo card that I received from my good friend Krista. She has the most adorable family, and the photo was a great match for the colors in this collection. I'm always grateful that Krista lets me play with her photos, since oftentimes I just don't have photos of my own family that will work. 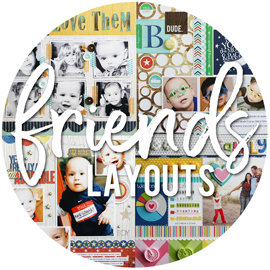 In return, I hand over the layouts to her to enjoy! I printed out one 4x6" photo for this layout, and then created a title piece on a 4x6" piece of my favorite grid patterned paper. In between the title piece and the photo, I lined up three of the fun 2x2" Candid Cards. I used a mix of alpha stickers to create my title. The red "family" alphas came from the new Treasures & Text sticker sheet, from the Family Forever collection. The mini green alpha stickers are from a High Five Alpha sticker sheet. And the "love" banner stickers are from the new Trinkets sticker sheet, also from the Family Forever collection. I machine stitched around the edges of the grid patterned paper piece a few times, and then added some corner stickers to sort of "frame" it. I debated on using a few different color crochet hearts in the center of the title piece, but finally decided on just the aqua crochet heart, and a few of our older yellow heart buttons. I adhered the title piece and the photo to either side of the layout, and then adhered the 2x2" Candid Cards using pop dots. The grey chevron patterned paper makes a great neutral background, and I just added some strips of the fun flower patterned paper and a few borders (a paper border and a border sticker). 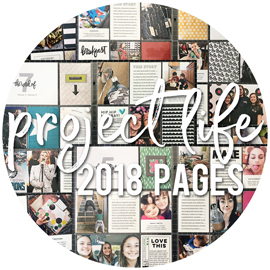 You can view and download our Family Forever project sheet, complete with step-by-step instructions and a complete supply list, RIGHT HERE.